I was first introduced to deck-building when @Futurewolfie taught me how to play Dominion. As a former avid CCG player, I was hooked immediately, but I quickly vowed that I would not collect another deck-builder for fear of the CCG’s downfall: monetary investment. 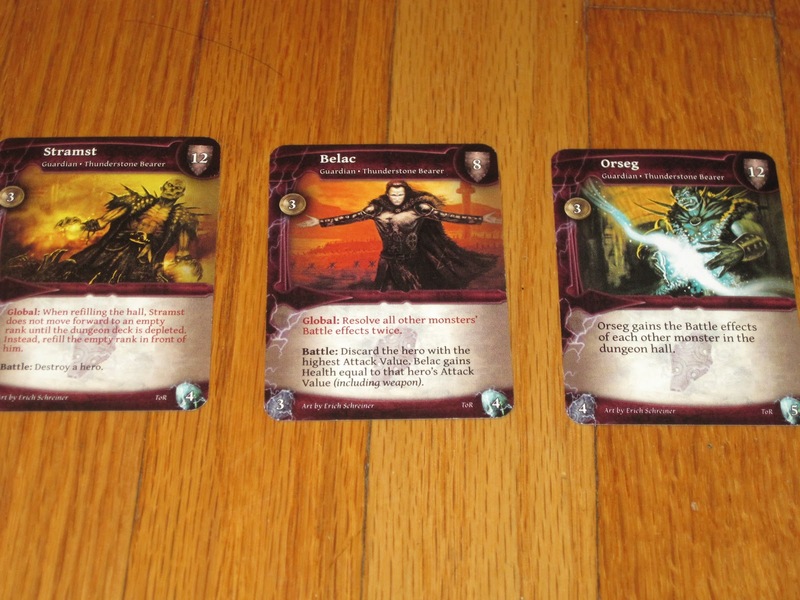 But then I saw Thunderstone Advance: Towers of Ruin, and I had to rethink my vow. Thunderstone is deck-building oozing with dungeon-crawling flavor. Had I vowed rashly? Is Towers of Ruin worthy of collection? Find out below! 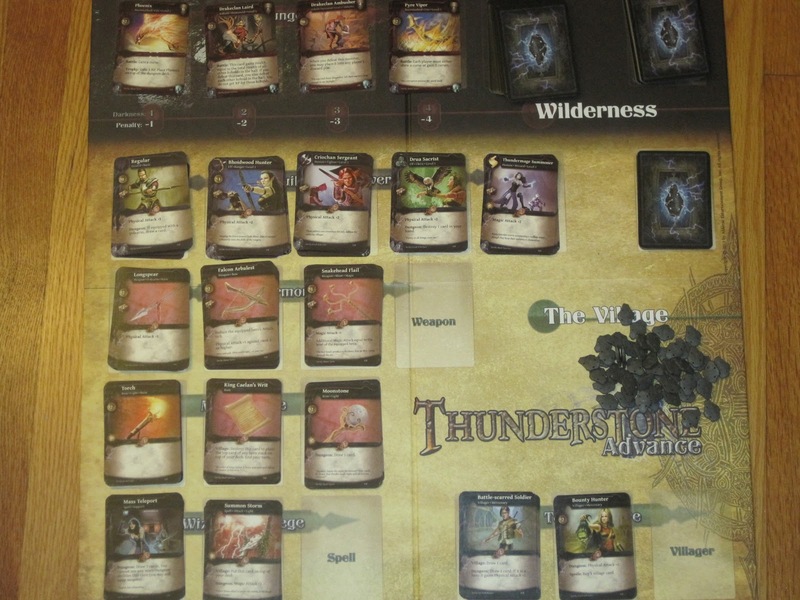 Thunderstone Advance is a deck-building game for two to five players. The goal of the game is to end the game with the most victory points, represented by defeated monsters in individual players’ decks. 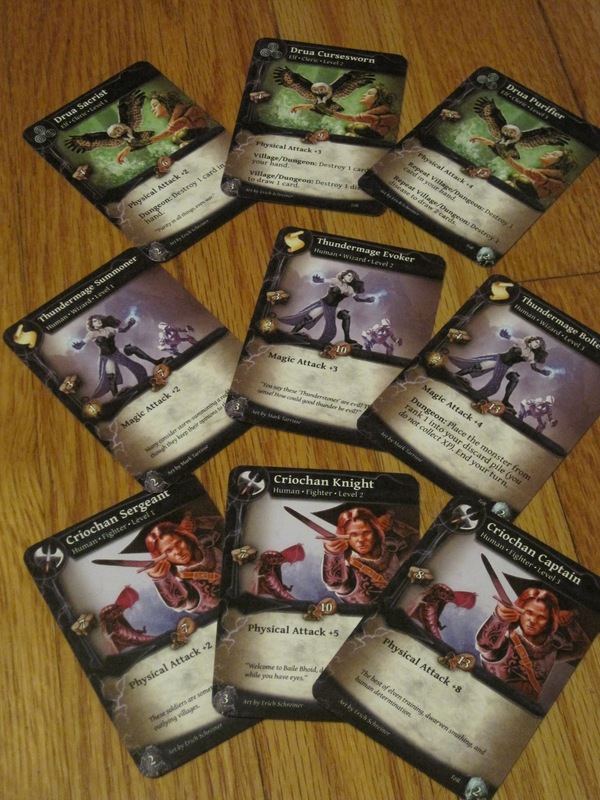 Each player begins with an identical deck of twelve underpowered cards (six regulars, two torches, two Thunderstone shards, and two longspears) and is turned loose to fight monsters in the dungeon. The easy side of the game board. 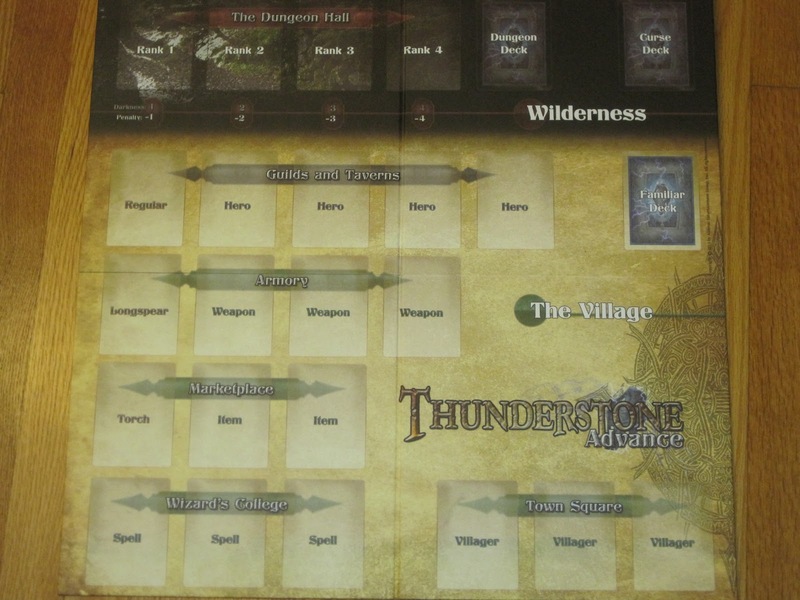 Thunderstone: Advance contains a double-sided game board with easy setup instructions. 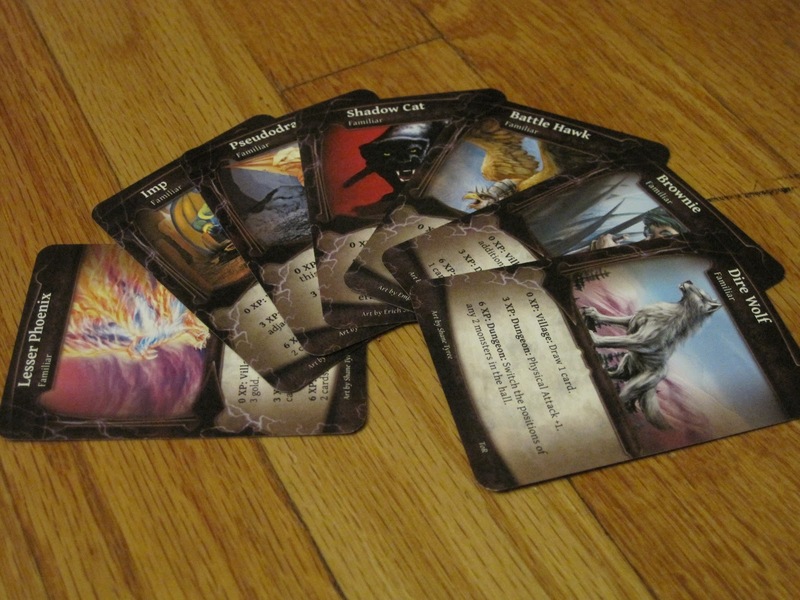 Randomizer cards are used first to create the dungeon for the game. Monsters come in levels 1, 2, and 3, and one monster stack of each level is selected and shuffled together. Then a random Thunderstone Bearer (the dungeon’s boss, a pretty nasty baddie) is chosen and shuffled into the final ten cards of the stack. Randomizers are used again to form the village, the general supply of cards that players may add to their decks. Village cards can be heroes, weapons, items, spells, and other villagers to help intrepid adventurers in their dungeon quest. Four hero stacks and eight other village stacks are randomly chosen and placed on the board. The game board is helpful in this regard: it limits the number of cards of each type that can be added to the game. This keeps a game from having too many unusable or comboless cards. Regulars (weak heroes), longspears (their weak weapons), and torches are available in every game, as is the curse deck and the familiar deck (both shuffled and placed face down). The top cards of the dungeon deck are revealed and placed on the spaces next to the deck on the board, and players draw starting hands of six cards. The game is now ready to begin. Thunderstone is a game with two currencies: attack and gold. Gold is used in the village to acquire new cards for a player’s deck that are generally helpful in defeating monsters in the dungeon. Attack is used in the dungeon to defeat monsters, which are worth victory and experience points (XP). This is the first game set up. Look at all that loot! If a player visits the dungeon, he reveals his hand and may use dungeon abilities (on cards), equip weapons to characters that are strong enough to hold them, and choose which monster to fight. Monsters have health, but depending how deep they are in the dungeon, players must also contend with a darkness penalty. The darkness penalty is greater the farther the monster is back in the dungeon, and this penalty affects the attack value of the heroes. Players may remove this penalty by carrying light with them (generally torches, though some weapons, items, and heroes also provide light). Once a player chooses a monster to fight, that monster resolves any battle affects noted on the card. If the player defeats the monster, the monster is added to that player’s discard pile and the player gains XP that he can later use to level his hero up. If the monster wins, it gets placed on the bottom of the dungeon deck and a new monster is placed in the dungeon. A player on his turn may also choose to prepare. Preparing allows a player to discard as many cards as he chooses from his hand and place the rest back on his deck, drawing them in his next hand. The final action a player may choose is “resting.” Resting allows a player to destroy one card in his deck, removing it from the game (a handy way to get rid of curses or monsters worth negative VPs). The game ends when one player defeats the Thunderstone Bearer. All players count the VPs in their decks, and the player with the most VPs is the winner. Thunderstone Advance is not my kind of game. And yet I still like it quite a bit. First, why it isn’t my type of game: I’m not a huge fan of the horror genre, and while Thunderstone has one foot firmly planted in fantasy (the reason I was interested in the first place), it dips its small toe into horror. Thunderstone Advance contains dragons, ogres, and kobolds, but also zombies and other undead. 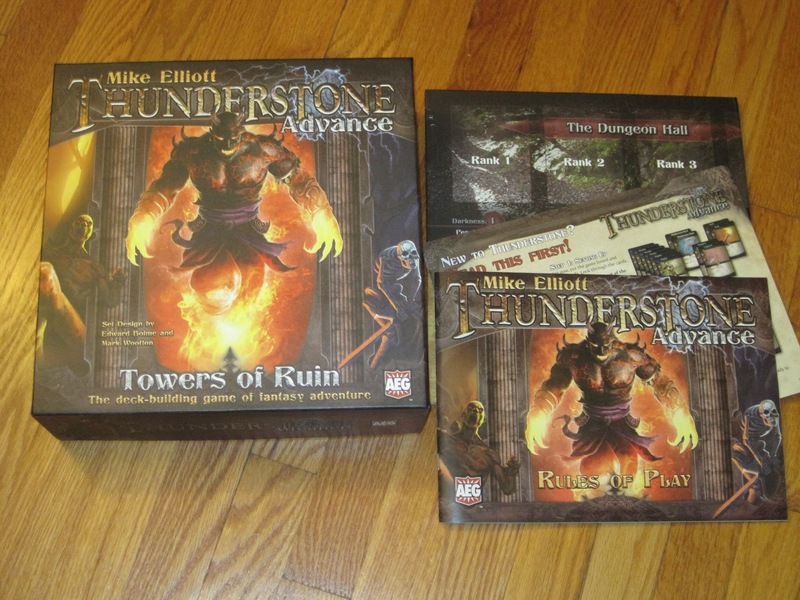 Thunderstone Advance is also a bulky game. The rulebook is a full forty pages, and it is much more complicated than Dominion and the Euro games I’m used to playing. It lasts on the long side for a deck-builder (though not on the long side for a dungeon crawl), and it can be a little slow to start, even with what I’ve heard are the upgrades from previous sets. 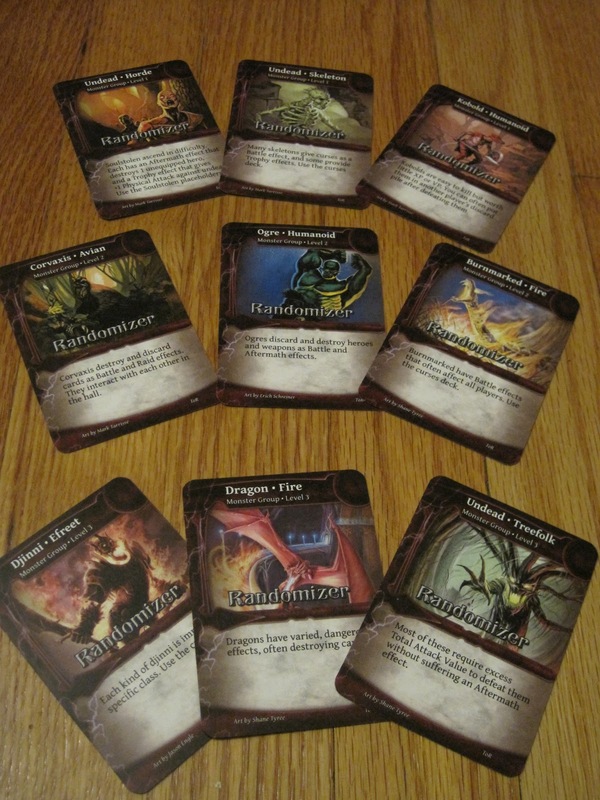 So despite these qualifiers, why do I still enjoy Thunderstone: Advance? The monsters you might fight. My favorites are the zombie ents. Theme. I’ve said elsewhere that theme usually doesn’t matter to much to me, but this is one game where the theme really delivers the goods. I love Dominion, but I will be the first to admit that the theme is a little…thin. The cards have some relation to their title, but I’m not interested in that beyond an initial look at the set: I’m interested in how they interact. With Thunderstone, you won’t make it very far if you don’t love the theme, but the theme, if you do like it, covers a multitude of sins. The game is a bit slow to get going…which is exactly what we would expect if a new evil appeared in the world and you had to marshal a group to fight it. The cards don’t always form great combos. Again, entering a dungeon in a pinch, you must optimize your work with the resources you have. But the theme in the game isn’t the only thing to like. Thunderstone is an interesting twist on the deck-building genre in its own right. It adds an element from RPGs, allowing players to level up their heroes (at which point the Final Fantasy music plays in my head). Defeated monsters provide XP that make the heroes better. Curse cards, unlike curses in Dominion, are different, and just like we might expect from a magical curse, the cursed player doesn’t always know what he’s going to receive since the deck is placed face down. Familiars enter and leave play, seemingly at whim, providing targeted benefits to their bearer. I also like the monster line-up in the dungeon. Similar to the center row in Ascension, the dungeon is always changing, and what monster pelts are up for grabs may not be the same when your turn comes back around. The monsters all have different battle effects, so wise adventurers will choose their prey carefully and wait for the opportune moment to strike. The components in Towers of Ruin are fantastic. The card art is well-done, but more than this, the cards themselves feel nice. They have a slick linen finish, and they yield well to the traditional shuffle (similar to Race for the Galaxy’s cards, if that means anything to you). The cards thus feel both sturdy and functional, a hard balance to strike. The included game board is also a nice touch. While it is essentially a glorified play mat, it is glorified. It makes what could be a long setup much easier, and the printed darkness penalties make them easier to remember. I also like that it’s double sided: you can set an easy or a hard game just based on which side of the board you play. The game includes XP counters shaped like Thunderstone shards, which aside from being a thematic piece of bling are also functional. But really, when I talk about the components, I have to mention the box itself. The Thunderstone: Advance box is huge, and what’s great about it is that it has expansions in mind. Dominion players’ appeal for a sanctioned storage solution has fallen on deaf ears, but it appears AEG has answered that call. 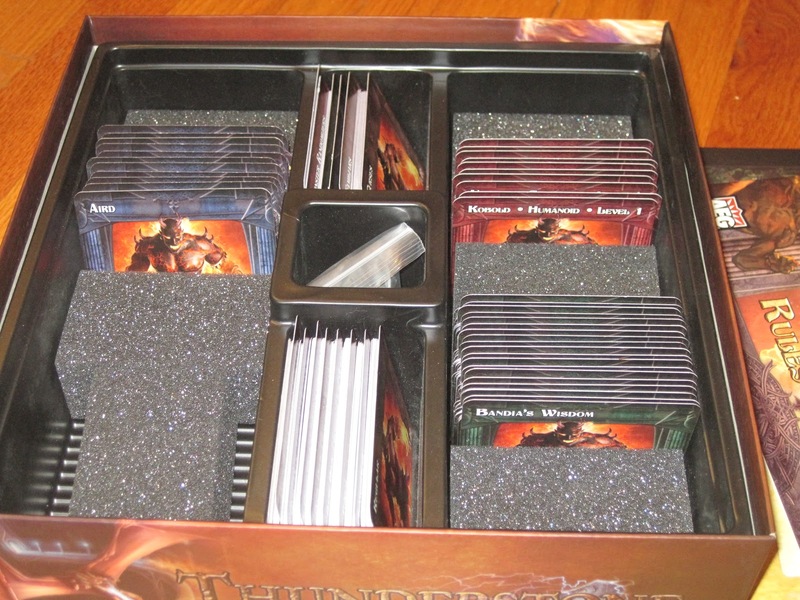 Included in the box are pre-printed dividers for each card stack included in the game, and the insert layout is begging for more cards to be added. The Advance cards fill maybe a quarter of the box; there is plenty of room for more cards, and the included foam blocks keep these cards from shifting all over the place. I haven’t played Thunderstone before Advance, but I will give major kudos to AEG for keeping the gamer in mind with their setup. All of this said, my enjoyment of Thunderstone: Advance does have its caveats. First, the game box advertises that a game will take around forty-five minutes. I don’t think any of my games fit within that time frame, even the solo ones. To test this out, @Futurewolfie and I played a game under ideal conditions: we played the recommended first (presumably, easier) set, had all the cards ready to go beforehand, and breezed through our turns as quickly as possible, and the game still took closer to 75 minutes. This isn’t necessarily bad (the game feels epic and fills the time well), but buyers looking for a good lunch game should be advised: this probably isn’t that. Another place where Thunderstone: Advance buyers should be advised is in Thunderstone’s ruleset. While deck-builders appeal to the former CCG-playing crowd, most are easy enough to draw in outsiders. (Admittedly, this is what attracts me to Dominion: I can get my wife to play!) Thunderstone has the core CCG crowd in mind, which means that the game is a little tougher to teach. There are more rules, more options, and more text on each card. Players benefit from knowing the available cards beforehand. There are also lots of little computations to make, similar to an RPG or table-top miniatures game, which will likely be a turn-off for non-hobbyists. Again, this isn’t a flaw necessarily, but buyers should be advised: if you couldn’t find someone who would play CCGs or RPGs with you before, you may have trouble finding a Thunderstone group. Rio Grande, take note: this is a fantastic insert with room to expand. Thunderstone, being a card game, has some dependence on luck. I mentioned earlier that the combo chains in Thunderstone are not always easy to spot, and because of luck of the draw, you may experience fruitless turns. (These can be mitigated by preparing and resting, but not always.) Fruitless turns can penalize players who fall behind as, without success in the dungeon and the resulting XP, they cannot level-up their heroes, but there’s really no fixing this. The best defense is to build a good deck and hope for the best. It can be frustrating, but it’s not a deal breaker. To sum up, Thunderstone: Advance is a fun game, but it is not for the faint of heart. Its mechanics are solid, but like the monsters you may encounter, they are not always elegant. The game doesn’t feel quite seamless, and it’s not one to pick up and teach others on a whim. But for those who like the dungeon-crawling theme and who are patient enough to learn it, Thunderstone can offer some sweet gaming experiences on a leisurely Saturday morning. The game comes with a solo mode, but really, it’s best with buddies. While this is the kind of game I could never get my wife to play, it provides an excellent opportunity to geek out with the guys. The obvious comparison to Thunderstone is Dominion. Mechanically, the games are very similar: you start with a weak deck, slowly purchase cards that will improve your deck’s ability to accomplish the final goal (with similar limitations on buying cards) until ultimately adding cards that are worth points but are useless to your deck’s functionality. Unfortunately for Thunderstone, all the things that make Dominion such a great game seem to come up a little bit lacking in Thunderstone. It’s just not as tight, not as precise, a lot more susceptible to luck, even if the deck you’ve built is good. Fortunately for Thunderstone, it does a lot of other things that Dominion doesn’t. I’m going to talk first about the bad stuff and finish with the good, to hopefully leave a positive taste in your mouth. Because it’s a fun game with only a few flaws. First up, as I mentioned, the game is far more susceptible to luck. You could have a neatly balanced deck with heroes and weapons and what not, but just not draw them in the right sequence. That low-level monster that’s easy to defeat might show up on another player’s turn, giving them the opportunity to kill it instead of you, giving them the XP to level up their hero, and removing that monster from the board only to have it replaced with something much stronger. 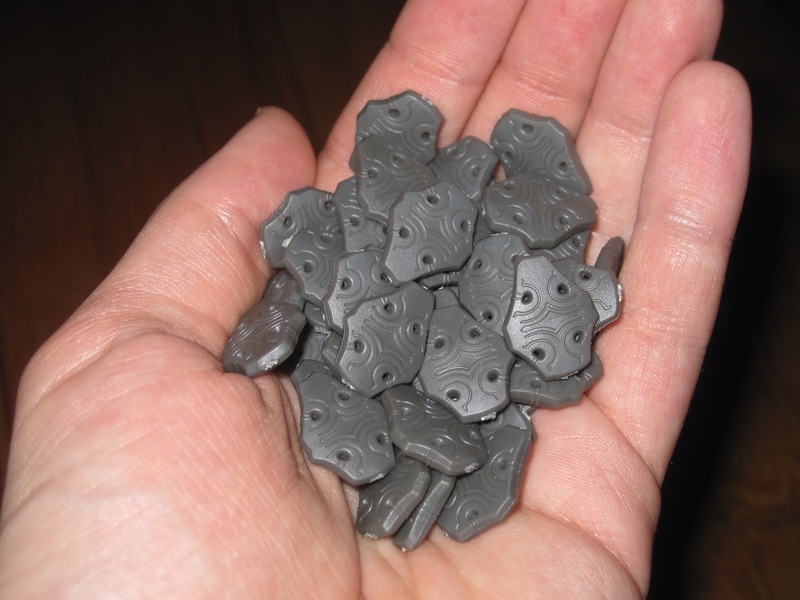 Familiars add a shot of flavor. Too bad @Futurewolfie can never draw the wolf. Which leads to the next problem: those who fall behind, stay behind. In Dominion, the players who buy point cards first slow their deck down, and you always have a chance of recovering if you’ve built a decent deck. In Thunderstone, even though you add the generally useless monster cards to your deck as trophies, you also gain XP to level up your heroes. With more powerful heroes, you don’t need as many useful cards in your hand to be able to take on more monsters, so it evens out a little bit. If someone pulls ahead early and manages to slay two or three more monsters than their opponent early on, it becomes essentially impossible for other players to catch up. Even if they pull together their deck (and their luck) eventually, you can generally only kill one monster per turn, limiting your ability to catch up in either XP or points. In addition, with the limited number of higher-level heroes to purchase, it is entirely possible for that player who surged ahead early on to nab most of the level 3 heroes before the other player has a chance to get there, which hurts them even more. Last complaint? I wish there were more Thunderstone bearers included, because three doesn’t give much variety. Okay, enough with the negative. Guess what? Thunderstone is still fun. Like @Farmerlenny said, it’s loaded with flavor. You’re building up a war party to head into the dungeon and slay some monsters. You recruit heroes, give them weapons, add spells, villagers, and other items into the mix, and you’re raring to go. It’s a blast to pull off a sweet combo to slay a might monster without getting hurt too much; to destroy a beast that sends curses into your opponents’ decks; to smash an insurmountable villain with an unstoppable force of heroes. The XP rewards are a great; not only is it a physical representation of your glory without clogging up your deck, but getting your level 1 heroes to level 2 and 3 is a nice feeling as well. The leveling system is great, but in a sense it could go either way as far as good or bad. There are six of each level 1 hero, four of each level 2, and two of each level 3. If the next level up is gone, you can’t level your hero. Even if you have a level 1 hero and the level 2s of that hero are out, but the level 3s are still there, you can’t skip a level. You’re stuck with that level 1. The limited hero stacks increase the level of interaction—it’s a race to grab the level 3 hero before anyone else does. And it definitely rewards the players that do better (or get more lucky) faster. But at the same time, it can definitely swing the balance heavily, especially if one player gets unlucky and just can’t get the XP to level up his heroes. That will make that player fall even farther behind, and they’ll spend the rest of the game knowing they’re going to lose and not being able to do anything about it. What a difference a level makes! Here are three heroes with their different levels shown. The rulebook is forty pages long, but there are a lot of examples and diagrams, and especially if you’re familiar with deck-building, it doesn’t take long to learn. There are a few keywords to remember, but the words themselves imply what they mean, so it’s not terrible to remember. It only took about ten minutes to explain to my gamer buddies who were already familiar with Dominion, because the concepts are all familiar. The extra turn options are not commonly used but occasionally useful, and thus are a nice inclusion (if you’ve ever wished in Dominion to be able to at least trash the curse when you draw four victory cards and a curse…). The game’s solo mode is not particularly exciting, since many effects are designed for a group of players, but it is a good way to learn the rules clearly before teaching it to the rest of your group. The theme is solid and the art is great. I disagree with @FarmerLenny about the “horror” aspect—there are undead, but this is a solidly fantasy-themed game, and undead are a common element in epic fantasy. There’s no sense of survival or fear, just a large force of enemy monsters you must rise up and heroically defeat. The variety of monsters is nice, and each type offers a unique feel or behavior, so it’s not simply a number and image difference. The Thunderstone bearers themselves all have unique effects that require a slightly different approach. And of course, the heroes included have their own abilities, from extra light, to rearranging monsters (affecting their darkness penalty), to destroying cards from your hand. It’s a blast to kill monsters as well—far more satisfying than buying a province or duchy. Thunderstone doesn’t reinvent the deckbuilding genre. It certainly does add a boatload of flavor and gives you a chance to slay some nasty monsters without any spite against the other players. (There are some things that affect other players, but like Dominion, they generally affect everyone—so you can never target anyone specifically.) It’s got great art and excellent production values, and the included storage is brilliant. It is going to take longer than 45 minutes, despite the box’s claims; you might be able to squeeze a solo round in that amount of time, but anything with multiple players will take anywhere from one to two hours. We’ve never played the original Thunderstone, but the rulebook mentions some of the things that were changed, and it seems like they are indeed major improvements. From what I understand, the old Thunderstone games are still fully compatible with this, so you can get the upgrades without sacrificing your existing collection; but if you’ve passed on Thunderstone before, this is the time to give it another shot. iSlaytheDragon would like to thank AEG for providing a review copy of Thunderstone: Advance. Want another opinion? Check out @BGJosh’s Thunderstone Advance review or the Thunderstone Advance review by The Board Game Family. Next Article FDQ: What Game Is Beautiful? Wow, very good review! I’m the fence on this one for my kids. I know they’ll really dig the theme. But its seems a little on the complex side (they enjoy Dominion), though on the other hand they’ve never shied away from complexity before…? Jason, if they know Dominion, that’s half the battle. You might have to direct some of their calculations, but it helps that Thunderstone is played open-handed (at least when you go to the village or the dungeon), so you could help them without intruding on their personal space. It does seem like it’d be above kids, but I’m continually amazed at what your kids can do, so they might be able to handle this one. I’ve seen there is a Thunderstone Facebook app if you just want to give the game a try. Thanks! Yes, they do amaze me, too! Even though they don’t always grasp deep strategy, teaching them complexity is good, too – allows them to grow and develop.